FACT Travancore Limited is a Government of India Enterprise involved in manufacturing fertilizer and chemical. This company located in Cochin, Kerala which is incorporated in the year 1943. Moreover, it also extended its manufacturing in petrochemicals and other allied products. It invites diploma degree holders to participate the Technician Trainee Apprentice in FACT and ITI holders for other disciplines. Any individuals who possess these qualifications and seeking to get some apprentice training, this is the right time to act and secure your position. The details about this notification are explained below. Individuals who are applying for this Apprenticeship Training Vacancy, they should be completed academic education in Diploma, ITI or B.Sc in any of the above mentioned disciplines. The education qualification must be obtained from recognized institution with good marks. The maximum age for Trade Apprentices job is 25 years, for all other vacancies the upper age limit is 25 years as on 1st April 2013. 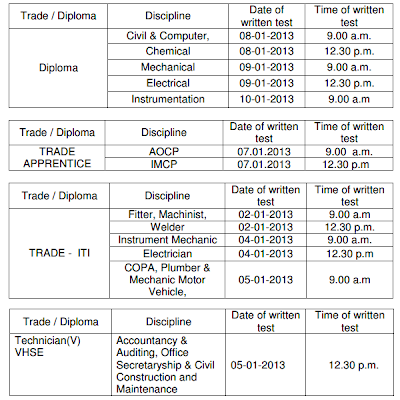 Selection of candidates will be based on the performance of candidate in qualifying tests. Candidates who passed in the written test will be shortlisted and invited for personal interview. Based on the overall performance, the final selection takes place. 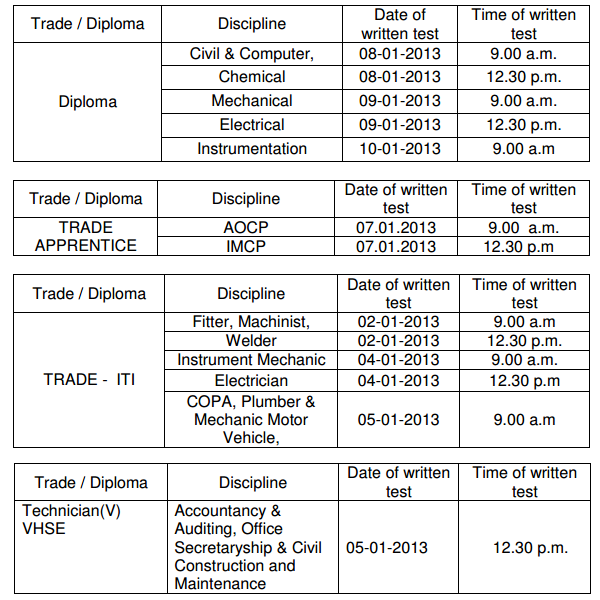 Interested candidates who possess above mentioned educational qualification can directly appear for the written exam. While going for written test the candidates have to take all the original academic and reservation (Community) certificates. You have to arrive at the address, “Fact Training Centre, Udyogamandal near kalamassery – Kochi” on the particular date which is scheduled for your qualification. The date and time for each disciplines are mentioned below. For detailed information about this vacancy candidates can clarify the official notification mentioned above.